Only 9 days until Christmas and I feel like there’s still so much not yet crossed off on my Christmas “to do” list! Not the list that tells me I need to put up the tree, buy gifts, and send out Christmas cards (aka the Christmas Chore list). No, I’m talking about the list containing all the creative things I really want to do as part of enjoying the holiday: make holiday fudge, make my own wrapping paper, create personalized ornaments… the list goes on! But it’s important (and especially at Christmas) to keep in mind that even though you WANT to do it all, fitting a ton of fun activities into a limited amount of time can end up being overwhelming and making the experience less enjoyable, overall. Treat yourselves kindly, friends, and don’t forget to take time to relax! Figure out what is most important to you and also what you can cut out, and then for what you can’t cut out, see if you can make it just a little easier for yourself. 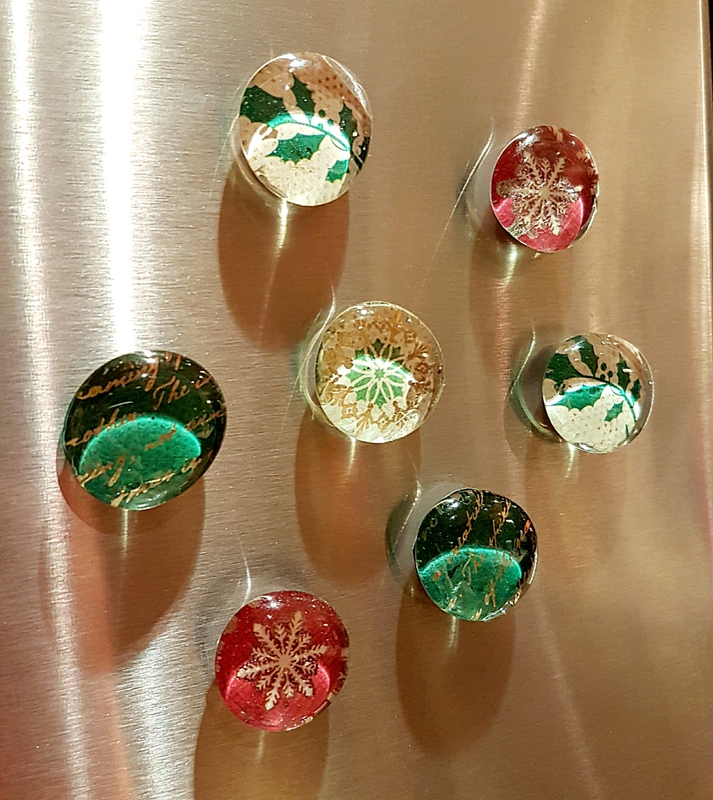 Which brings me to today’s mini DIY post: DIY Christmas glass fridge magnets! These DIY gifts are so easy and quick to make, so if yoi were planning on making gifts this year but don’t want to do anything too complicated, then this will shave a ton of time and stress off your busy schedule. This project is technically just an update to a previous DIY project I’d posted about almost 2 years ago for Valentines day. Think of it as an expansion pack for base game: you’ll need to read and be familiar with the steps described in the previous post, but this post brings that project in a different direction by showing you how to make it Christmas appropriate! So. Hopefully you’ve just come back from taking a peek at that post and are now ready to see some inspiration on how to “Christmas-ify” this project. Instead of Valentines themed scrapbooking paper, try finding a few coordinating Christmas-themed scrapbooking sheets at your favourite craft store. 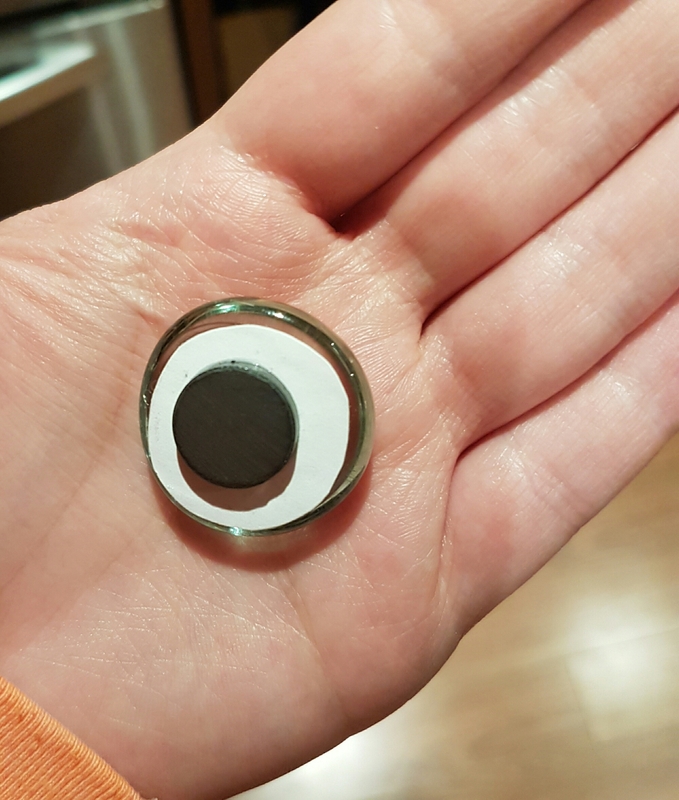 Try finding prints that have tiny, repetitive patterns that will fit well into the small circle shape of your glass pebble. It’s also good to try to get a few sheets that are different colours, but still coordinate well together. This way, if you choose to give them as a gift (similarly to the gift pockets in the Valentines post) then you have a few different types to combine into a gift pocket. Do you hold on to Christmas cards after the holiday is over, but not really know what to do with them? 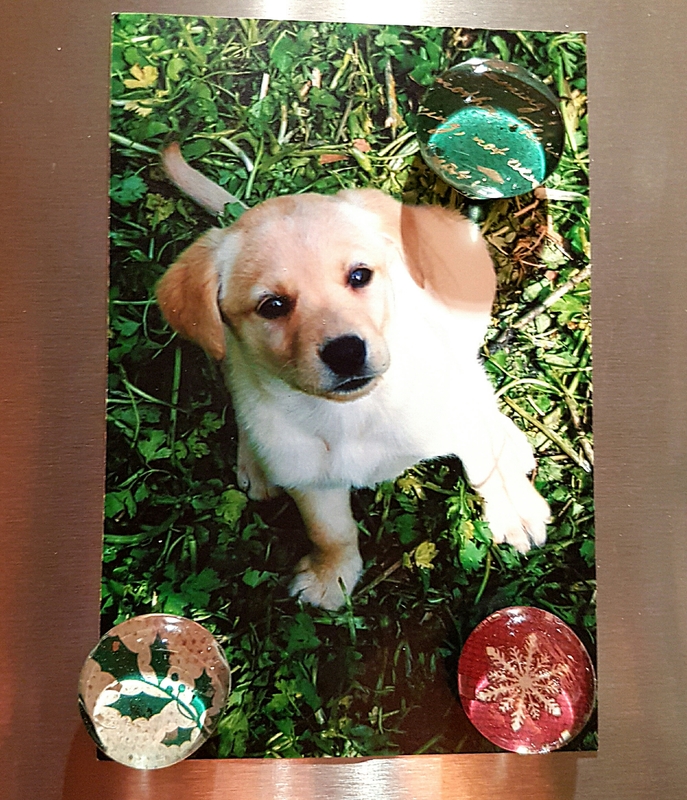 Another great way to upcycle last year’s Christmas cards is to cut out cute images from your old cards to use for the magnets. The thick cardstock is a great material that holds up well to having glue applied to it, so this is a perfect way to use up those cards! 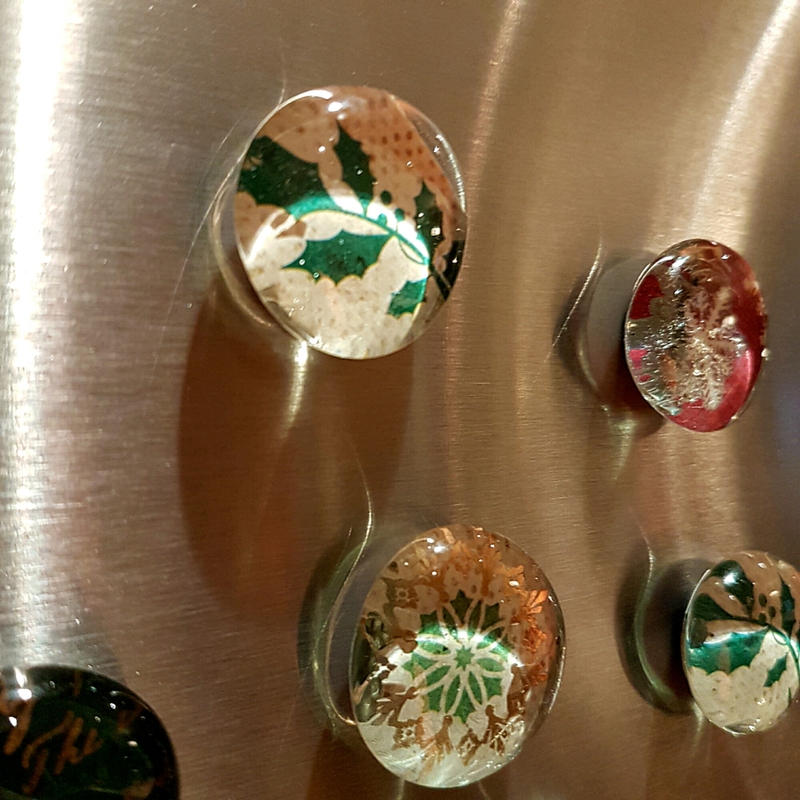 Another way you could incorporate Christmas designs is by using cute wrapping paper as your image to glue under the glass stones. There are so many gorgeous wrapping paper designs out there, and usually the plasticized paper holds up pretty well. 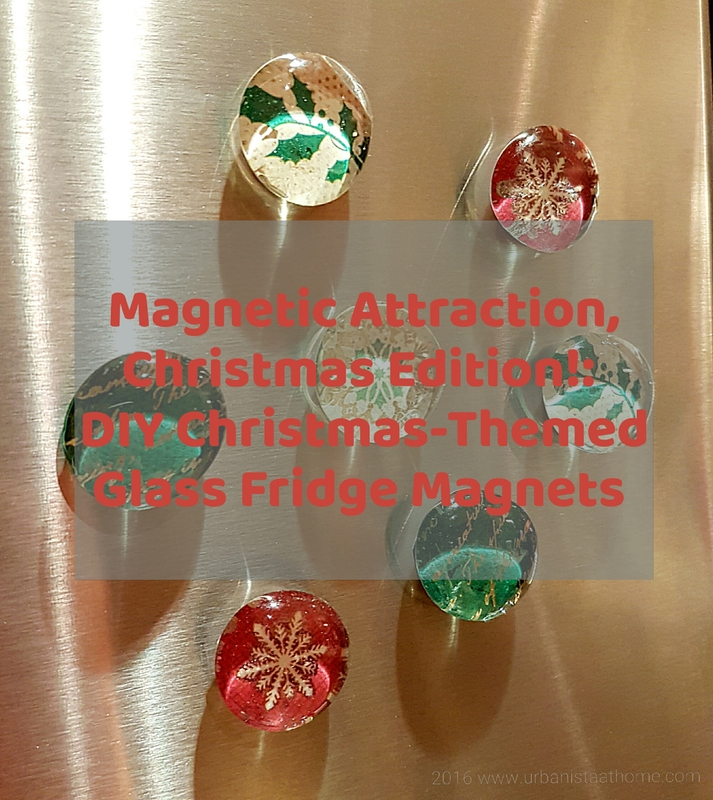 The only thing you’ll have to ensure is that the magnet doesn’t show through the paper, since wrapping paper is usually thin. 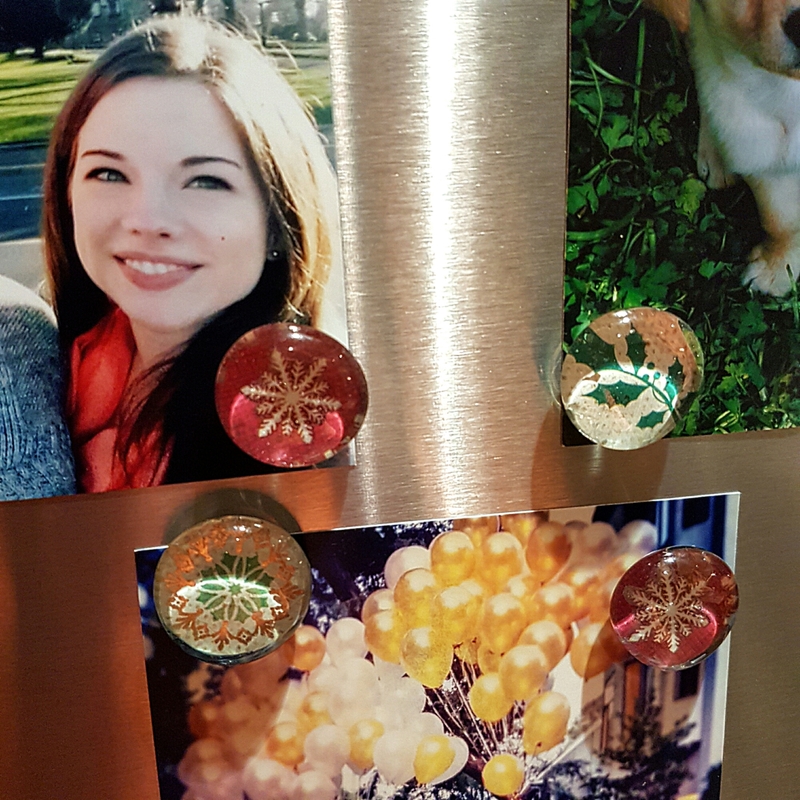 Try gluing a piece of white cardstock between the magnet and the Christmas paper to ensure this doesn’t happen. Use leftover bits of the Christmas paper you choose to create little gift tags for your magnet gift pockets, then tie the pockets up with ribbon and thread on the tags. It’ll be pretty enough to park beneath the tree. Merry Christmas, and happy crafting!